I sat on the rickety wooden steps that descended from Courtney’s house to the beach, watching the sky’s riotous colors as the sun set over Chappaquiddick, the tiny island that floats off the eastern edge of Martha’s Vineyard. The sky above swirled with a particularly brilliant blend of orange and pink. The evening had grown chillier as the sun went down, and I pulled my thin Patagonia fleece jacket more tightly around me. As the colors faded, I turned back to the house, which glowed, a glass box built into the spectacular landscape. Through the large window that fronted the ocean, I could see some of my dearest friends sitting together on couches, and their animated voices and laughter carried out, calling me back into the cozy living room. As I pushed the heavy glass door open and stepped onto the concrete floor, I heard Allison’s voice. “This really has been the best decade yet.” I walked quietly into the circle and sat down next to Quincy on the edge of one of the couches. The room smelled of the ginger and soy sauce that flavored the salmon that was in the oven. Courtney was an excellent cook, and by this night, the final of our three-day weekend, we’d noted that her early post-college years in Tokyo had shaped her culinary tastes. I could feel the cold of my feet through my jeans as I tucked them underneath me. I looked around the room at my dearest friends splayed on couches and chairs. There were six of us this year, on our seventh annual weekend reunion. In 2010 Allison and Kathryn had started this tradition, and since then we’d gathered, always in late September, at homes from Florida to Rhode Island to Lake Tahoe. The weekend had become sacrosanct to me—I’d never missed one. “At least so far I love this decade. I am surprised, honestly, but it feels that way.” Allison went on, and I glanced around the dusky room at the familiar faces that I had known since we met at Princeton, at eighteen. Now, in our early forties, we had officially passed the “we’ve been friends with each other more than half of our lives” mark. Several others nodded. “I thought of forty as so old. Forty was my parents when I was a kid. But now it’s me, and it’s actually sort of great,” Courtney said from her perch across from me. It is often the case that I’m not totally sure where my memories end and the photos that I’ve seen so many times begin. I don’t know exactly why this is, but I suspect it has something to do with how throughout my childhood I frequently and carefully pored over the photo albums my father made and kept, each meticulously annotated in his fountain pen script. But for whatever reason, I do recall my father’s fortieth birthday party with particular clarity, though I wonder now if it was that I somehow had a sense of the significance of the milestone, even then. I can imagine his face, with the mustache he wore for most of my childhood, smiling at the guests, and the Windsurfer my mother gave him tipped up against the back wall of our house. “And then there’s that thing when you see someone from college,” Quincy said. “And you remember them as they were, but obviously we’re not that anymore.” I started laughing quietly as Courtney stood up and walked back to her bedroom. “That happened to me at work recently,” I added. “I saw Jamie, and my God, he’s all senior now, and he walked into a conference room in a high-rise, and all I could think about was how the last time I saw him he was facedown in a taproom, you know?” More knowing laughter, and then Leonora leaned forward. “Remember when you had to wait twenty-four hours—or sometimes, if you were really lucky, only one, for photos to be developed?” I said, suddenly laughing hard. We all looked up as Courtney walked back into the room, carrying an eight-by-ten framed photo. “Remember this?” she said, holding out the frame. I stood up and looked over at the photograph she held. I knew it well. It was a large group of us at the P-rade during reunions weekend, right before we graduated. We were wearing our canvas Princeton reunion jackets and, I remember, drinking warm, flat beer from a case that was sitting behind us on the grassy hill. We look so young, of course. But we also look unabashedly jubilant, and I remember a distinct feeling that the future rippled out in front of us, assured, shimmering, certain. I have so many similar pictures like that one at the P-rade from our years at college. Our hair is too long, our faces are beer-puffy, and we are usually wearing, to a person, an unflattering uniform of baggy jeans, oversize plaid flannel shirts, and baseball caps. We are often holding red Solo cups, which inevitably were filled with cheap beer or vodka and whatever mixer we could rustle up. The days of plaid and Solo cups feel simultaneously like yesterday and like a different life. Back then we talked endlessly about everything. The future was out there, and sometimes we imagined it, but we were also concerned with the minutiae of our everyday lives in that moment. We discussed ad nauseam what boy was interested in what girl, who was going to house parties with who, where we should go on an empty Saturday afternoon to lie in the sun (the horrors of that particular dilemma are etched on my skin now, believe me). We talked about grades and school, and I’ve often thought that the fact that I can tell you what each of my dear college friends wrote her senior thesis on is some kind of unusual marker of intimacy. In the years after college, we fanned out, mostly to New York, San Francisco, and Boston, where we crammed into small apartments, often together, and into business suits and heels. Then, on our first, clunky cell phones, we talked about work and travel and asked questions about Excel and when being drunk became worrisome. I remember vividly a conversation I had with Quincy. I stood in my tiny bathroom in my first apartment in Beacon Hill packing for yet another business trip in my first job as a management consultant while she regaled me with a story about her first kiss the night before with the man she’s now been married to for fourteen years. As the years unfolded we began wondering about who we’d marry, children we might have, and what we were going to grow up to be. Now that we are in our forties, many of the questions that preoccupied us in earlier decades are answered. That’s both wonderful and sorrowful, of course, because with answers come closed doors. What we worry about now is totally different. Almost everyone in this particular group of friends has children, so we talk, and worry, about them a lot. We worry about our aging parents and their health. We worry about wrinkles and whether it’s okay at this age to be intrigued by the clothes at Talbots and even—gasp—Chico’s. Too drapey? We worry about our marriages and about our careers and those of our partners. Many of the questions feel bigger, and they’re certainly more shadowed with life and death, as we consider mortality, either our own, in the cases of tragic early illnesses like cancer, or that of our parents. Of course the day we all turned forty the questions didn’t change overnight, but it is true that that marker arrived in the midst of a transition for most women I know. It’s interesting that even as we are aware of the weight of more complicated matters on our minds, most of us also feel liberated. We care less about the small stuff (wrinkles and linen pants, I suppose, aside). I was one of the first of us to have babies, which means I now have some of the oldest children. As Grace nears fifteen and Whit settles into twelve, I feel the weight of their gaze on me in a new way. As soon as I got my sea legs on the storm-tossed boat of parenting, it feels like the days with my children living at home are numbered. I’m viscerally aware of wanting to be a role model for them, and that informs the things I think about and the things I do in a way that I had not anticipated in previous decades. I know this is coming for the friends who circle me in the rapidly dimming room on Chappaquiddick. Between us we have children ranging in ages from five to fourteen, graduate degrees, full-time professional jobs, part-time professional jobs, divorces, parents who are sick or who have died. We have lived in a variety of cities across the United States. We have families of various configurations and have made a lot of different choices, but we are all the same age. I love hearing Allison describe her forties as her favorite decade, because I feel the same way. This stage of life feels like one long exhale. It’s also exhausting and overwhelming—more than any other time in my life, I feel pulled thin, and like so many people need me—there is no question about that. But I think most of us, at forty, find ourselves grateful for what is, even as we remain anxious about what lies ahead and sad about what will never be at the same time. When I turned forty, two years ago, I called the decade I was entering the “thick, hot heart of life’s grand pageant,” and that only feels more true now. I have never loved my birthday, the same way I’ve never loved New Year’s: I do not need to be reminded of time’s drumbeat, its inexorable passage. I already feel it every day. Nevertheless, turning forty was unexpectedly thought-provoking for me, and judging by our conversations this weekend and over the past couple of years, for my friends, too. That particular birthday ushered in a new and urgent need to recognize and capture and appreciate my truly ordinary life. The day I turned forty, I woke up early, drove an hour and a half with my husband to pick up our children at sleepaway camp, and then came home to wash their two large trunk-loads of laundry. I went to the grocery store, we had dinner around our dining room table, and my mother surprised me by coming over for dessert. I felt like the most fortunate woman alive, and even the most mundane parts of the day felt glossed by a blossoming awareness of how holy every moment of my life is. Since that day, my life has proceeded much the same as it had before I turned forty, replete with frustrations and exhaustion but also, now, underpinned by a sense of sturdy joy that feels new. The first couple of years of my forties were bumpy, with some medical scares and a big professional transition, but while I’m never going to be called a Zen person, I found myself, surprisingly, calmer. The changes rattled me less than they might have in the past. I don’t know precisely what to ascribe that to, because in many ways the stakes seem to be going up, not down. But overall, I’m more aware of how the arc of time smooths out most bumps and am less inclined to panic about individual problems. Every woman I know has come to her forties (those of us lucky enough to do so) with a slightly different family circumstance. Married or not, a mother or not, working or not, parents alive or ill or not living. Regardless of these differences, which can be dramatic, I’m struck by how many parts of reaching midlife feel similar. The grappling with adulthood, in all of its beauties and losses, is remarkably universal. We are all accepting that there are things that will never be, just as we look around and acknowledge what is. That acknowledgment runs the gamut from a full-on embrace to wholehearted rejection. There’s also a shadow over our days of what’s to come—mortality hovers around our experience now, and an awareness that the days ahead of us may not be longer than the days behind. Forty feels like we’ve come to the top of the Ferris wheel: the view is dazzling, in no small part because we know how quickly the descent will go. So there’s no question that turning forty is an opportunity for both reflection and inspiration, which is why I am thrilled to introduce this collection, which is brimming with both. This book is full of reflections from individual women that also reveal and revel in the universal. From women of myriad backgrounds, a chorus rings true: the forties are a decade of reckoning and awareness, of gratitude and loss, and they are limned with emotions as divergent and powerful as the individual voices that speak to them. These women, in their forties and beyond, are in the prime of their lives. These are not reflections on the dying of the light, but rather a full-throated celebration of what it means to be an adult woman at this moment in history. 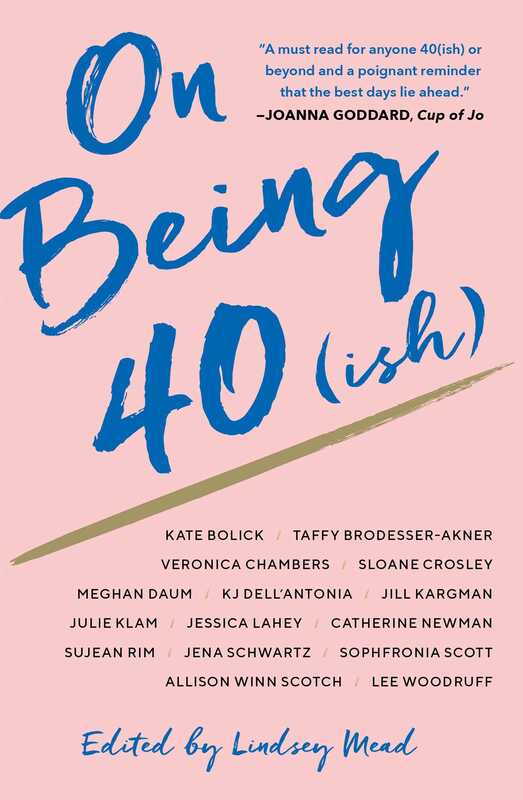 Most of the essays in this book are written by women who are squarely a part of Generation X, and they read, also, as a powerful treatise on this generation’s experience of midlife. We are exhausted, and we are happy, and we are busy, and we are trying to reckon with the costs and opportunities of the unique clarion call of our generation: that we could have it all. A promise that turns out to be both a blessing and a curse. From musings on beauty (of course) to life post-divorce, the nostalgia of friendship, and the ever pressing question “what now?,” these pieces are a dynamic and diverse kaleidoscope, but consistent themes emerge, too—a newfound clarity about what matters and what doesn’t, a deepening engagement with our lives as they are, and the sorrow and elation of the truest cliché I know: time flies.